Home Blog Post Proposal: What you should know about your ring after he pops the question! Maybe if you are reading this he just popped the question and you have a brand new piece of bling resting on your left hand. First off CONGRATULATIONS! This is such an exciting time in your life and we truly are so excited for you! For most girls this may be your first piece of diamond jewelry. If it is this post is going to help you keep your ring in perfect wearing condition for many many years! First things first, ask him if your ring came with a warranty from the store it was purchased from. We hear all the time that their fiancé forgot to tell them that they had to have their ring checked every so often in order to keep it under warranty. Robinson Jewelers requires you to stop in every four months and have your ring checked and cleaned. During this cleaning process we not only clean your ring we check your prongs and make sure that for the next 4 months as long as nothing major happens you are good to go, stones are tight, prongs are in their rightful place and you can wear it with no worry. Just to show you how inexpensive this insurance is I went through and requested an instant quote for a ring that values at $5,000..get your own quote by clicking on the image above! 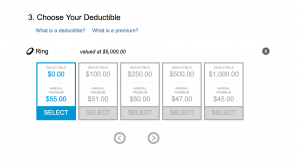 Second thing is … look into insurance for your ring. Although you may have a warranty through the store it was purchased from like the one we give complimentary to each and every engagement ring client, that only covers you so far. There are awesome insurance companies like Jewelers Mutual that will cover your ring for those times that we can’t help you. Maybe you lose your ring in the ocean, it’s stolen, or ran over by your car, jewelers mutual may cover it. Click the link above to get a free quote on what it would cost per year to insure your piece. Third, make sure it fits properly! Your fiancé did his best getting your finger size when he purchased your ring but until your ring is on your finger we have no idea if it is a perfect fit. Every woman’s hand is different and every ring fits different on each finger. If you are feeling as though it is too loose or too tight please stop in and see us! We are pro’s at making sure your ring fits correctly and you have no issue with it sliding off! The best thing about bringing it to us is your ring never leaves our store during the repair process. We do all repairs simple or complex in our state of the art jewelry repair center. 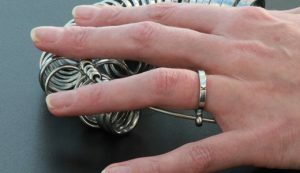 Last but not least if your ring is white gold here are the facts on how to care for your ring. White gold is an alloy of gold and at least one white metal, usually nickel, manganese or palladium. Like yellow gold, the purity of white gold is given in karats. White gold’s properties vary depending on the metals and proportions used. With all that being said a rhodium finish is put on top of white gold to give it the bright shiny look you love. Over time that finish can wear, we want you to know…. It is normal! You probably won’t notice for many many years but if you do see it changing stop in and for a small fee we can refinish your piece like the day he put it on your hand! 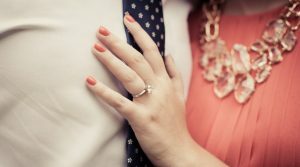 We hope this post has been help to you as you wade the waters of being newly engaged! We are always here to help you with any questions you may have about your new piece! Congratulations!